Newark is an attractive busy market town situated on the River Trent and the River Devon, where the Great North Road intersects with the Fosse Way Roman road. The town's official name is Newark-on-Trent and it originally developed around the 12th century Castle which now lies in ruins thanks to Oliver Cromwell and his Roundheads. 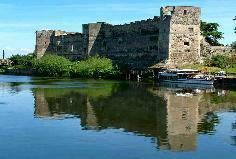 Opposite the castle is the award winning Riverside Park, with childrens play area and café. The town boasts two museums situated within the centre. Millgate Museum shows the town's broader history from the Stone Age to the 19th century, and offers a glimpse of the social and working life of the town in the 19th and 20th century. The Town Hall Museum consists of the Town's Treasures and civic history dating from the 16th century and the first Charter. As well as civic plate, insignia and gifts, there is a gallery of fine art on the second floor. To make the most of your visit to Newark why not visit the Tourist Information Centre where you can pick up detailed information, leaflets and maps.